Some high-end brands are neglecting mobile, new Google Wallet phones, and PayPal's happy surprise. Here are a few of the items that caught my eye this week. Few high-end retailers are moving as quickly as they should on mobile commerce, according to a new report from research firm L2. In its first survey of premium brands’ mobile strategies, L2 looked at the mobile and tablet platforms of 100 prestigious retailers — names like Dolce & Gabbana, Clinique and Cartier. In spite of their high margins, L2 found that most were taking a wait-and-see approach to mobile commerce, even though U.S. m-commerce sales are expected to grow from $6 billion in 2011 to $31 billion by 2016, according to Forrester. L2 placed 44 of the 100 brands it surveyed in the “feeble” category. At the other end of the spectrum, only four companies seemed to be doing enough right to earn a place in L2’s “genius” category. Sephora topped the list, thanks to solid mobile and tablet apps, and successful cross-promotion of its mobile offerings across the rest of its digital platform. Nordstrom, Macy’s and Net-a-Porter rounded out the top four. It may look like a dismal showing, but as Lauren Indvik pointed out at Mashable, it may be enough to lead the rest of the retail competition. Indvik cited figures from Jesse Haines, group marketing manager for Google Mobile Ads, who told Mashable that a survey of major advertisers in early 2011 found only 21% had launched a mobile site at the time. If you’re like me, you’ve begun to see point-of-sale devices promoting the capability to pay with Google Wallet around town — for example at Whole Foods, Radio Shack, and CVS. Google has a nifty little map app that shows you where in your zip code you can wave your NFC-enabled Sprint Nexus S 4G phone to pay for — oh, you don’t have a Nexus S 4G phone? Yeah, that’s the problem: I’ve yet to see anyone actually making a purchase in the wild. Sprint said this week it will do what it can to help by introducing two more phones that support Google Wallet: Samsung’s Galaxy Nexus and LG’s Viper. That brings the total number of phones that support Google Wallet to three. Both of the new phones store the payment applications on a secure embedded chip. 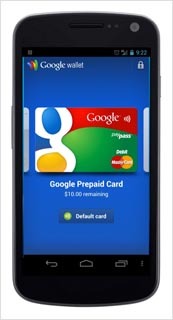 Buyers will need to use either Google’s Prepaid Card or a Citi Mastercard. The secure chips can also store coupons, points and offers. Google will need all the help it can get from Sprint to spread the base of Wallet users, at least until the other carriers, all of whom are founding members of Isis, decide to let Wallet onto their phones. Verizon’s decision in early December not to allow Google Wallet on its Android phones has cast a shadow of doubt on the whole business. Meanwhile, all the players in the mobile payment system continue to run trials and tests to see where the soft points are. Visa said this week that it has certified six mobile devices to handle NFC payments using its PayWave system, a point-of-sale device that can process Visa payments wirelessly from a mobile device or a PayWave fob or card. On ZDNet, Zack Whittaker reported that in the U.K., Visa is hoping to roll the technology out as far as it can in time for this summer’s Olympic games. The volume of mobile payments is rising faster than expected, as shown by PayPal’s announcement that it processed nearly $4 billion worth of mobile payments in 2011. That’s up from $750 million in 2010 and $141 million in 2009. David Marcus, vice president of PayPal Mobile, made the announcement at the Consumer Electronics Show in Las Vegas. A year ago, Marcus told VentureBeat, the company predicted it would process $1.5 billion in 2011, a figure it later revised upward to $2 billion. Marcus credited, among other things, Starbucks customers using PayPal to top off their cards and the rise of iPad-based e-commerce. Next stop: moving offline to point-of-sale devices. PayPal announced a trial using PayPal at the register in Home Depot stores, with no NFC required. For now, it’s a limited test with a handful of PayPal employees who can use a PayPal card or just enter their mobile numbers in a point-of-sale terminal to pay for their DIY supplies. PayPal expects to roll it out to a wider audience later this year.